You may be interested in Walking Dead merchandise, video games, movies, and many more. Deals and voucher codes that you can use at reputable online UK sellers will certainly not disappoint you. Check out the offers of Amazon, eBay, Tesco, and other popular UK retailers and see which deals are the most affordable and reasonable. Take this wonderful chance to find what you are searching for and get them at very low prices. Spending money on quality Walking Dead items that are offered by reputable UK retailers is a great deal. The Walking Dead No Sanctuary the Board Game - with Discount Code! The Walking Dead Board Game - with Discount Code! 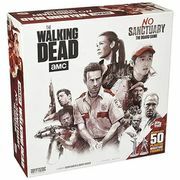 The Walking Dead No Sanctuary the Board Game - HALF PRICE! Free The Walking Dead t-shirt - just pay P&P! Enjoy huge discounts The Walking Dead merchandise online! The Walking Dead is a popular horror American TV series about post-apocalypse. Frank Darabont created it for AMC based on the comic book series by Robert Kirkman, Tony Moore, and Charlie Adlard. Sheriff deputy Rick Games, the show's main character, played by actor Andrew Lincoln, woke up from a coma only to discover the world is being run by zombies or "walkers." When he reunited with his family, he formed a group with other survivors to lead the takedown of the walkers. The group tried to adapt and survive in a world full of walkers and other surviving groups who opposes them. The opposing groups are often even more dangerous than the walkers themselves. The series is filmed in and around Atlanta, Georgia, and later Alexandria, Virginia. This Walking Dead debuted in 2003 has made its way not only in television but in everything you can see. From Walking Dead video game to Walking Dead t-shirt, there’s something for every fan out there. If you are looking for a Walking Dead gifts for him or her and other Walking Dead merchandise as a present for Christmas and other special occasions, you have come to the right place! According to Telltale, The Walking Dead: The Final Season will be the last season of the long running American apocalyptic horror television series. So now is the best time to buy DVDs or Blu-Ray of the series including The Walking Dead Season 2 and The Walking Dead Season 8. Take advantage of cheap The Walking Dead box set which has the eight complete episode if you want to save even more. Here at Latest deals you will find the bargain deals on all your favourite TV shows. Our community of bargain hunters regularly share verified deals and offers on cheap original Rayman PS4 from major UK retailers to help you save on your purchases. We also have a team of money-saving experts who share essential tips and tricks that will help you get discounts in your instore and online shopping. Most UK retailers often have sale events such as clearance and flash sales where you can save as much as 70% off on an extensive selection of cheap The Walking Dead merchandise. They also reduce their prices even further during Black Friday, Cyber Monday, and Boxing Day. 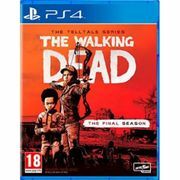 You can maximise your savings and get additional money off by using the latest Walking Dead discount codes you can find here. There are even voucher codes where you can get freebies and free shipping on your purchases. The Walking Dead Seasons 1 Through 4 DVD Set. If you want to watch it with your whole family and collect DVDs at the same time, this set is a must buy. The Walking Dead Collection. This includes the Rise of the Governor, The Road to Woodbury, The Fall of the Governor – Part I, The Fall of the Governor – Part II, Just Another Day at the Office: A Walking Dead Short - aside from the comic books and novels you have, there are also quality books that focus on one aspect of the series. With these e-books, the readers will experience the extended backstory of The Governor. McFarlane Toys The Walking Dead TV 10″ Rick Grimes Deluxe Figure. This super detailed figurine is the character named Rick. This is a good collectible for the avid fans. The Walking Dead Trivia Game. If you are truly a fan of The Walking Dead, this game will test you out with 20 character cards deck full of trivia questions about the series.